It is always a nice surprise when one gets the chance to view a new or interesting locomotive during it's first days in operation. 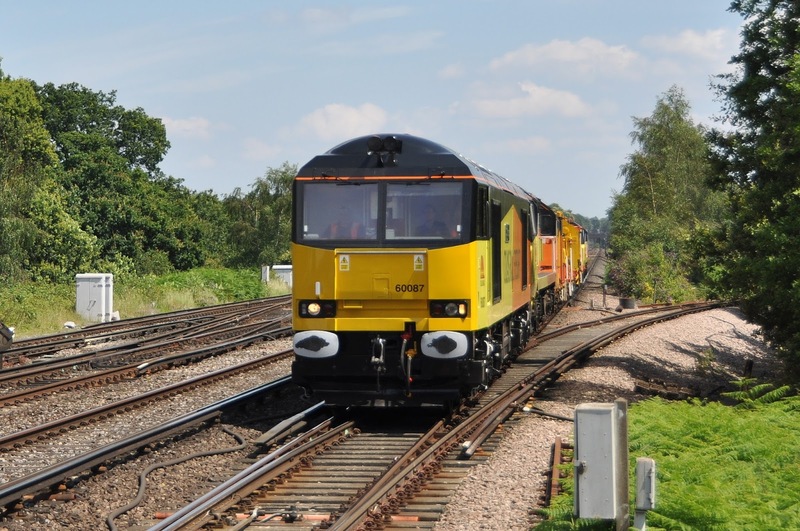 While it cannot be said that 60087 is a 'new' loco, it's appearance on a Rugby-Eastleigh train on Friday 4th July was noteworthy as one of the locos first runs for it's new owner; Colas railfreight. This was also quite possibly it's first revenue earning working during daylight hours. 60087 approaches Byfleet & New Haw running from Rugby to Eastleigh (for driver training). It is unusual to see freight trains on the main line here- usually they would come from the Staines line which can be seen joining to the right.